On Tuesday the winners of the Democracy For All Video Challenge were announced at an event aimed at putting the issue of big money in politics front-and-center and creating a platform for people to express themselves and take action to support the Democracy For All Amendment. Two advocacy organizations, Say No To Big Money and People For the American Way, created the video challenge that encouraged Americans to produce public service announcements supporting the proposed Democracy For All Amendment. Speaking at the National Press Club event was U.S. Senator Tom Udall (D-NM) and U.S. Representative Ted Deutch (FL-21), who are lead cosponsors of the Democracy For All Amendment (H.J.Res.22, S.J.Res.5). 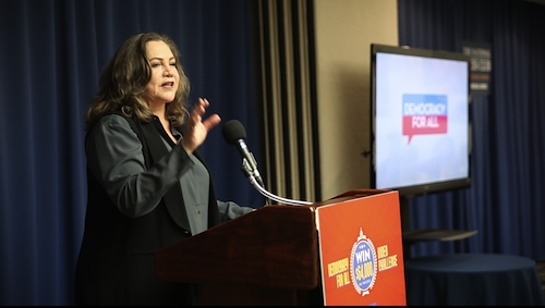 The winning videos were announced by Academy Award-nominated actress Kathleen Turner, with Say No To Big Money president Jeff Haggin and People For the American Way president Michael Keegan and executive vice president Marge Baker also speaking. The grand prize video, “Voters, assemble!” was created by Bryan Warner – a nonprofit communications director from Fuquay-Varina, North Carolina – and uses animation to depict a secret meeting between a group of villains who are plotting to nefariously influence politics by using big money. The video illustrates how easy it is for corporations and special interest groups to buy their way into Washington and influence policy in their favor. As the grand prize winner of the video challenge, Warner will receive $25,000. Awards were also given to five other videos, with the creators receiving $5,000 each. The winners were: “The Most Influential Man” (funniest video), “Voice of the 99” (most dramatic video), “American Show” (best original song), “Why Our Democracy Needs to be Changed” (best student video) and “Our Democracy is Not For Sale” (most creative video). All the winning videos can be viewed here. The Democracy For All Amendment, currently being considered by Congress with 144 cosponsors in the House and 41 supporters in the Senate, would overturn cases such as Citizens United, the 2010 Supreme Court case that paved the way for unlimited political spending by corporations and the super wealthy. People For the American Way (PFAW) is a progressive advocacy organization founded to fight right-wing extremism and defend constitutional values including free expression, religious liberty, equal justice under the law, and the right to meaningfully participate in our democracy. More information is available at www.PFAW.org. Say No To Big Money is a 501c4 nonprofit corporation for the public benefit with the mission of supporting the ratification of the Democracy For All Amendment that will regulate campaign contributions. Say No To Big Money is nonpartisan and does not promote or take sides on any political issues nor endorse candidates or elections. More information is available at www.SayNoToBigMoney.com.